6.5 days. That is how many days of school we have left. (Not that anyone is counting, right?) The anticipation of summer vacation has students acting crazy and teachers struggling to find ways to harness all that energy while still being academically-productive. Getting students to focus this time of year is TOUGH. Most are day-dreaming of swimming at the lake, trips to the beach, summer camp, and driving around with their friends. One trick to keeping them on-task and productive? Sidewalk chalk! 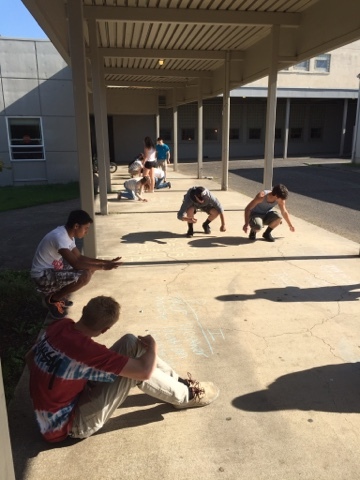 With sidewalk chalk, you can turn just about any lesson into an engaging, hands-on activity that gets students outside like they have been begging for AND provides students with a meaningful learning opportunity! Win-win! REVIEW: The Spanish 1 students in the picture above are reviewing for their final project by writing sentences about a variety of topics. Each square was labeled with a different theme that we covered this year in class (la comida, la ropa, la ciudad, me gusta(n), mi familia, etc.) and students rotated to each square and wrote one complete sentence for the topic, plus drew a simple picture to illustrate their sentence. Could we easily have done this in my classroom? Of course. Were students waaaaaay more engaged and excited about writing sentences when they had a piece of chalk in their hands and drawing/writing on the ground? YES. The format also made it simple for me to go around and give feedback to students on their sentences. You could easily adapt this activity to review topics you covered in your own classes. The Spanish 2 students below are reviewing for their final exam by working in pairs to compare and contrast preterite and imperfect. Each group took over a square and had to draw a picture to help them remember the differences between the two tenses, write five "buzz words" for each (siempre, los domingos, el jueves pasado, etc. ), list five examples of when each tense is used (weather, age, single completed action, etc. ), conjugate 3 verbs in each tense, and write two example sentences for each. Once squares were complete, we spent 10 minutes gallery-walk style checking out all the squares. Students had to discuss with their partners what made sentences examples of preterite or imperfect. Again, could I have done the same thing as a worksheet? Absolutely. Did my students have a lot more fun, were more engaged, and retain more by doing the task this way? Absolutely. Lots took their phones out afterwards to take a picture of their square to use as a study tool over the weekend. Love it! 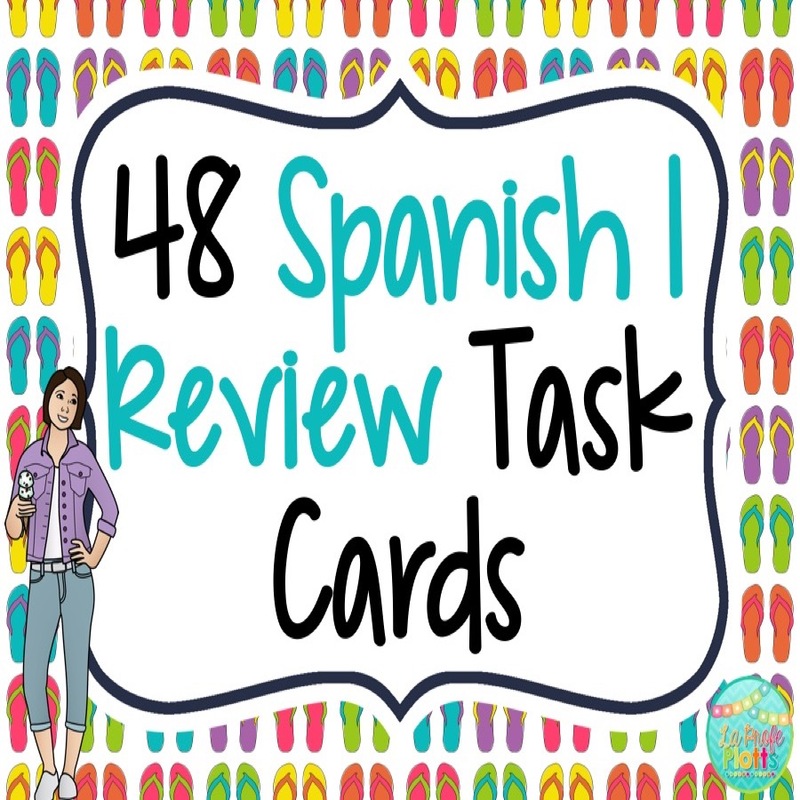 This activity works great for any review day, any level of Spanish. SENTENCE WRITING: Give students scrambled sentences and have them write out the sentences with the words in the correct order. VOCABULARY REVIEW: Call out vocabulary words in Spanish and have students draw pictures to show understanding and label in Spanish for spelling practice. TIC-TAC-TOE: Have students play Tic-Tac-Toe with verb conjugations. GAMES: Turn any game into an even more fun competition by having students compete outside with sidewalk chalk! 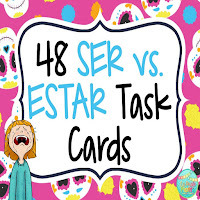 Check out THIS BLOG POST for games I love playing with task cards. The relay race game would be really fun outside if you had a good wall to write on! TASK CARDS: Love using task cards as much as I do? 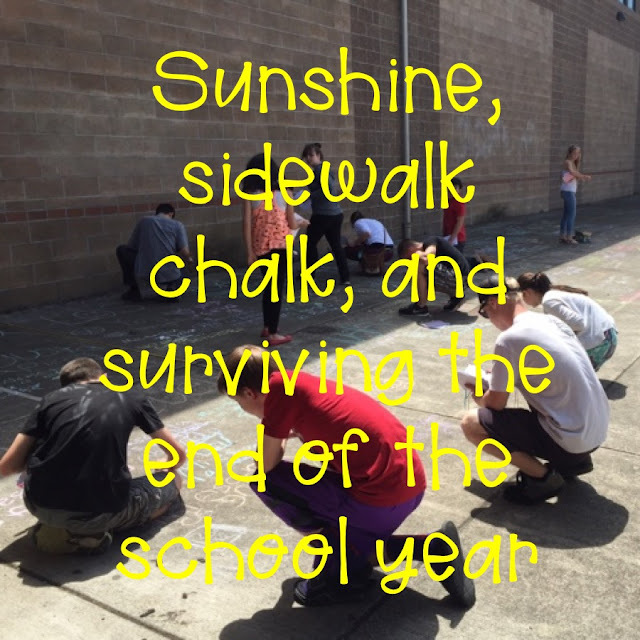 Lay them out and assign students certain ones to complete using sidewalk chalk! 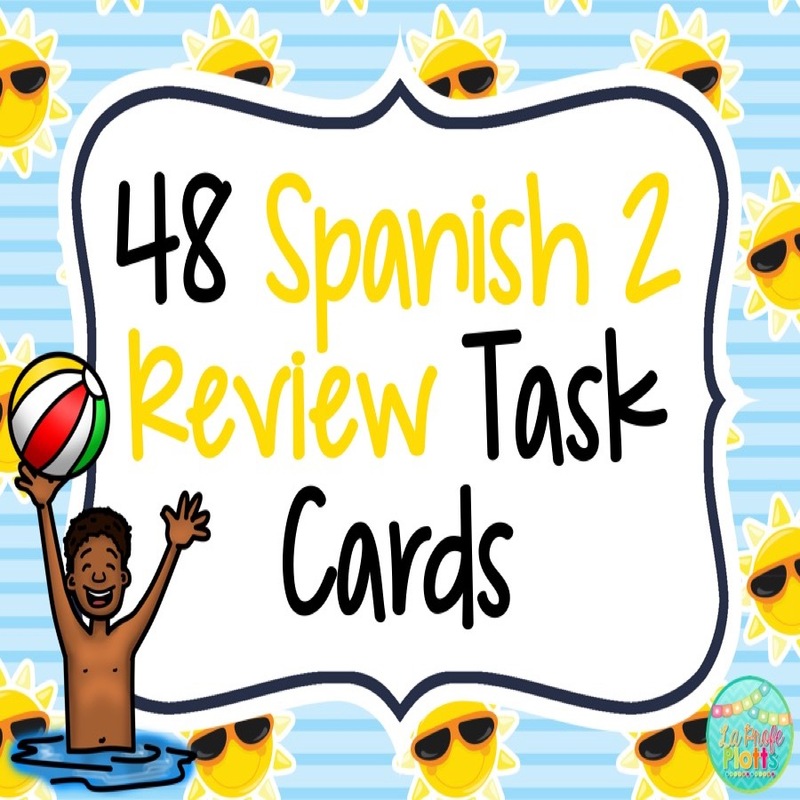 Looking for task cards to review everything your students learned in Spanish 1 and Spanish 2 before you send them out the door for summer? Check out these cute summer-themed sets! 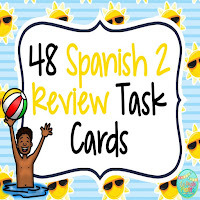 Each is designed to give your students a well-rounded review of topics covered in Spanish 1 and Spanish. 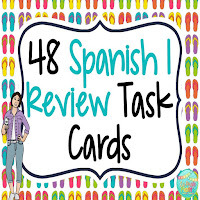 Click HERE for the Spanish 1 task cards and HERE for the Spanish 2 task cards! These would be perfect for using outside with sidewalk chalk! There are hundreds of different ways you can use sidewalk chalk with your classes. Please leave a comment below if you have a great idea you want to share! I would love to hear it! One thing I cannot live without in my classroom would be my bag of dice! A hodgepodge of colors and shapes, they are never far from my desk and ALWAYS a hit with the kids. See the purple one in the picture? That one is always the first to be chosen! Get away from boring worksheets by using dice to add some spice! 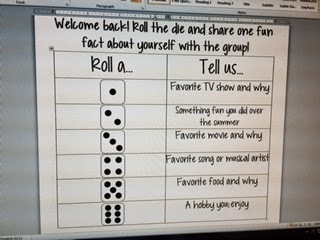 Start the school year by having student break into small groups and taking turns sharing fun facts about themselves based on the number they roll. 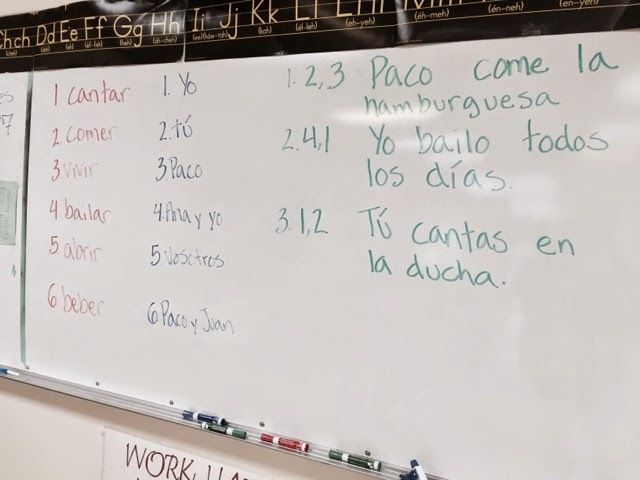 This also works well later in the term as a review activity with questions like ¿Cuántos años tienes?, ¿Cómo te llamas?, ¿De dónde eres?, ¿Cómo estás?, ¿Qué te gusta hacer?, ¿Cuál es tu clase favorita?, ¿Cómo eres?, or whatever it is you want your students to practice. Great activity to reinforce a new verb tense or review before a test! 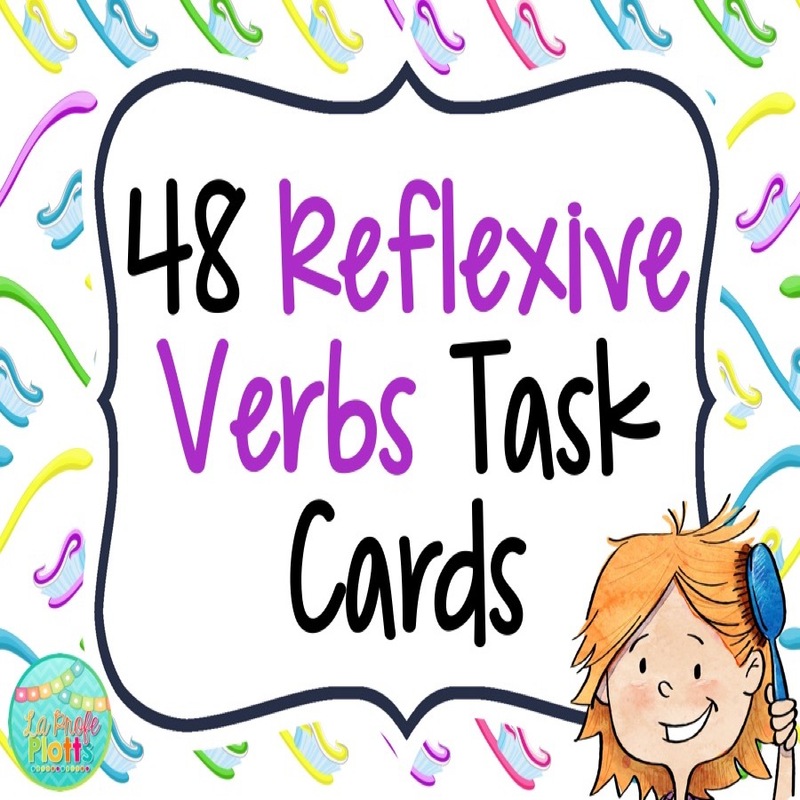 This activity can be done with any verb tense or set of verbs. 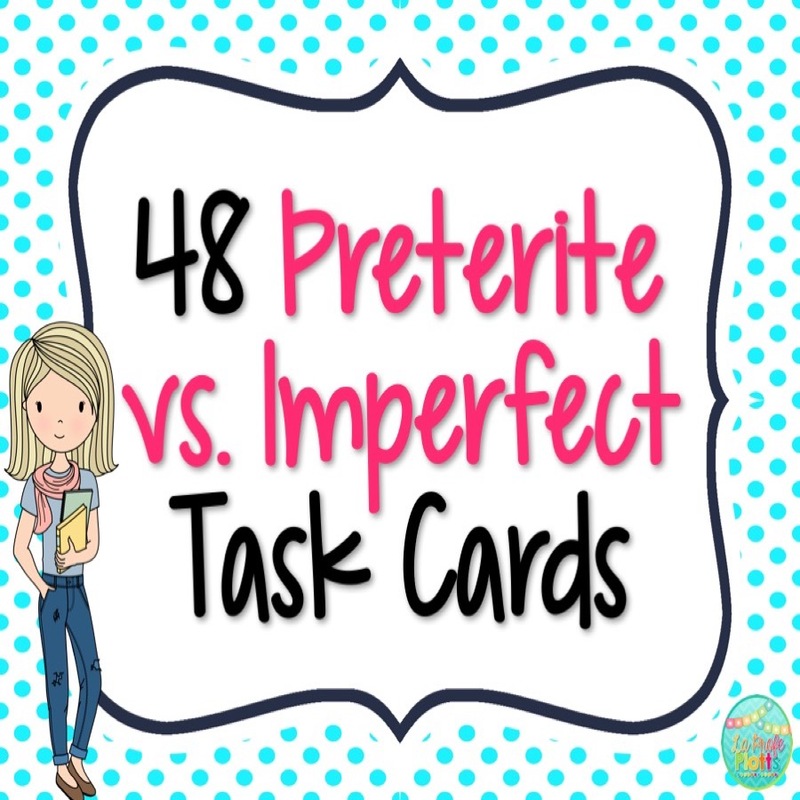 I have done this with everything from the imperfect tense to a list of present tense irregular verbs that needed review. To do this activity, put students into pairs and instruct each group to take out a piece of paper and a writing utensil. While one student numbers the piece of paper 1-30 (I mix this up between the person in the group who is the oldest, youngest, has the next birthday, arrived at school last that day, has the longest hair, etc. ), have the other student in the pair choose a die from the bag. 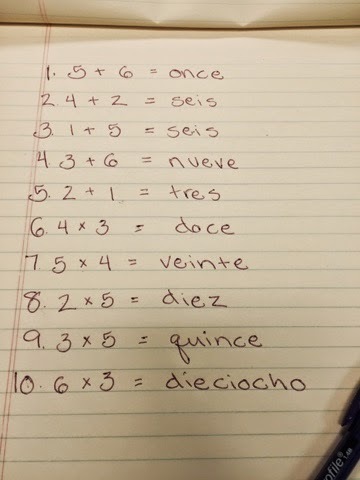 Once everyone has their papers numbered and a die, do a quick whole-class review on how to count from 1-6 in Spanish. Then choose one student to roll his/her die and tell you the number in Spanish. Write the number on the board (see green) and have him/her roll one more time. Put that number next to the first number with a comma in between. Do two more examples with the students and then instruct them to have the student with the die roll and tell (IN SPANISH!) while the other student writes the numbers for 1-15 and then switch roles so dice kids become writers and writers get to roll and tell for 16-30. Have them hold their die when they are done. Once all groups have 30 number combinations, bring everyone's attention back up to the board. Tell them the first number in the combo indicates the verb they will be conjugating in the preterite tense (or whatever you choose- see red) and the second number tells them what subject they are conjugating for (see blue). Look at the three examples in green with the students. The first number is dos. What verb are we using? Comer. The second number is seis. What subject? Ellas. What is the ellas form of comer in the preterite tense? Comieron. Write that next to the numbers 2,6. Do the other two examples and ensure understanding before turning pairs loose to conjugate their own 30 combinations. 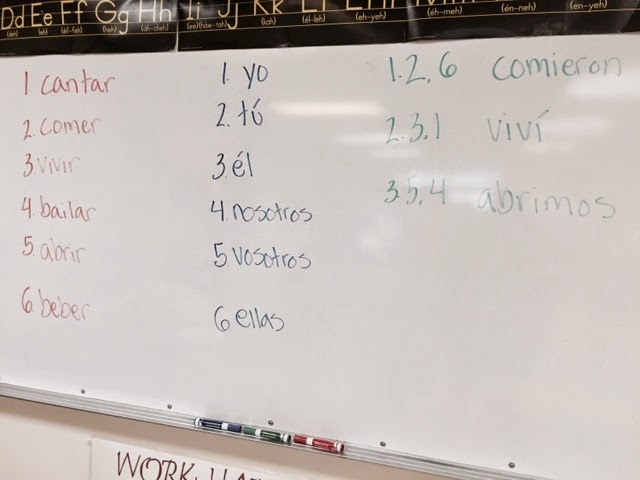 Make sure to tell students to work together to conjugate the verbs instead of divvying up the list. That method does NOT help them learn how to conjugate! I always erase the example answers once students get going so they cannot copy those onto their own sheets if they happen to have the same combos. Before a group can turn in their paper, the group has to find me. Each person in the group has to roll two dice, do the conjugation in his/her head, and tell me the answer out loud. If both correct, they can turn their paper in. If someone gets one wrong, they need to double-check their answers. Fast finishers in the class? Have them do verbal conjugations by rolling the dice twice and doing the conjugation in their heads and saying the answer to their partners. Partners can then verify whether or not that conjugation is correct before taking a turn. Similar to Activity #2 where students conjugated verbs, except now students are writing complete sentences in pairs. I like to do this activity at the end of the unit when students are comfortable with verb meanings and conjugating and are ready to put everything together. To do this activity, set it up exactly like you do for #2 all the way until students have rolled their 30 number combinations and are waiting for further instructions. NOW, do a quick review of what the verbs in red mean. 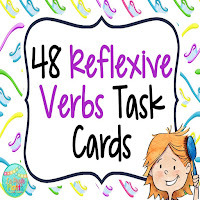 Then tell students they are going to be writing present tense sentences (or for whatever verb tense you choose) for various verbs and subjects. The first number in the combo tells them the verb the sentence needs to include (see red) and the second number tells them what subject the sentence should use (see blue). Check for understanding by asking students what verb Example #1 (see green) will use if the first number is dos. The answer? Comer. What subject will the sentence use if the second number is tres? Paco. Now show them how to write a complete sentence using that information. Reviewing the formula SUBJECT + VERB + COMPLEMENT always helps my students. Encourage students to write rich sentences that include more than just a subject and verb. Talk about adding details to sentences like the how, what, when, where, and with whom. Do two more examples with the class and try to elicit each part from the students. Once you feel confident in their understanding of the activity, have them write their own sentences with their partners. Extension activity: After all the groups are done writing their sentences, hang all the papers up around the room. Then have pairs walk around together and translate one sentence on each paper. Can be any sentence on the paper that hasn't been translated yet. By doing it that way, very rarely do you come across a group who cannot translate a single sentence. Helps students feel successful, keeps them engaged, and builds their confidence. To keep groups accountable you could give a different color of marker, crayon, or colored pencil to each group. That allows you to quickly see if all the pairs made it to all the papers. Are your students learning numbers? Put them in pairs and have them number a piece of paper 1-30 (or whatever number you decide on). Have students in each group take turns rolling a die and writing down number combinations. Students only know 1-12? Have them turn those numbers into addition problems and solve. Answers should be written out in Spanish. Maybe your students know up to 36? You could have students make multiplication problems with the numbers and solve. Again, answers should be written out in Spanish. Give students a list of assignments numbered 1-6 and have students roll a die to determine what activity they will each do. For some reason, students are a lot less likely to groan about an assignment if they are responsible for their choice as opposed to me telling them to do it. I usually do 2-3 rounds. If students roll the same number twice, have them roll again until they get a new number. 1- Verbs charts! Conjugate the irregular verbs SER, IR, and VER in the imperfect tense, as well as the regular verbs JUGAR, VIVIR, and ESCRIBIR. 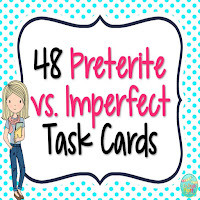 2- Write a paragraph of five sentences about what you were like as a child using the imperfect tense. 3- Write five questions you could ask a classmate about things he/she used to do or would do when he/she was younger. 5- Fill in the blank! Complete the 20 fill in the blank sentences on the sheet given to you. 6- Task cards! Do the 5 task cards hanging in the back of the classroom. 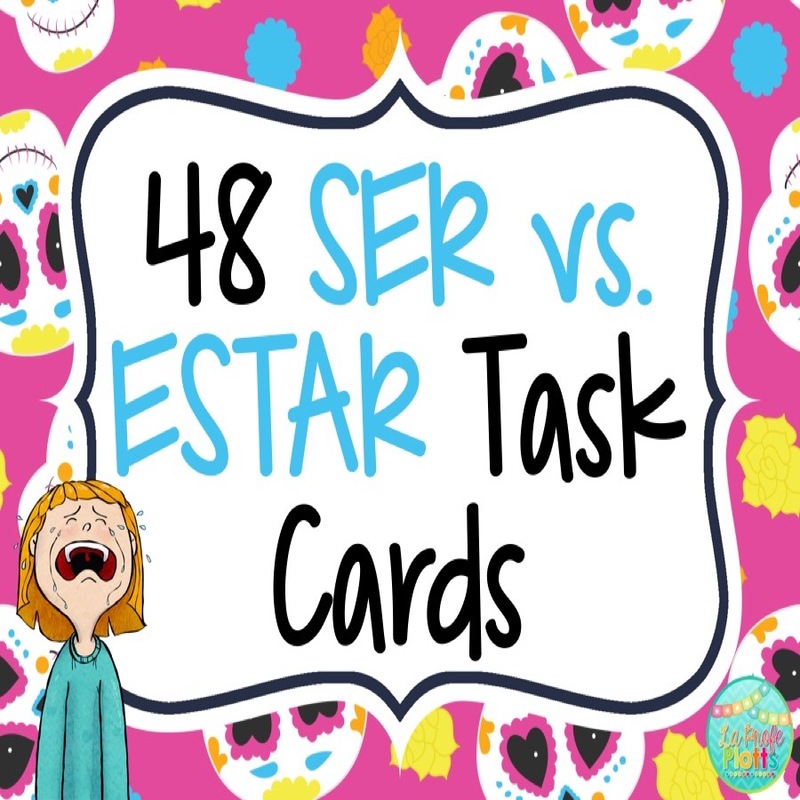 Here are a few of the task card sets I use in class. Click HERE to see all 60+ in my TpT store. 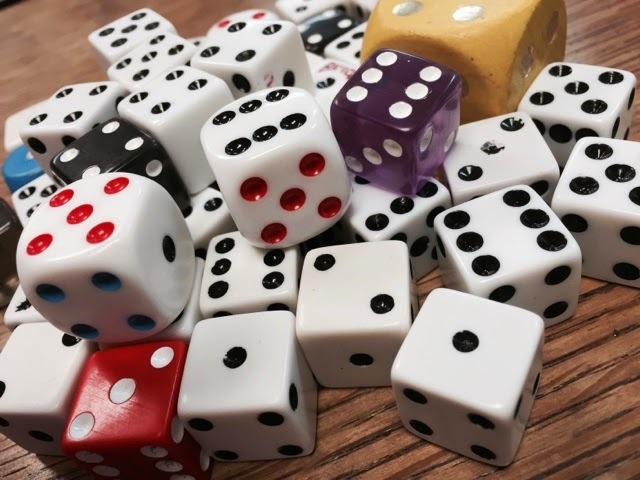 **Have you used dice in your classroom? I love learning new ways to use them! Please share in the comment section below. Thanks!